Coming to the office today, after taking the GRE (I did fine) I was in the far right lane, about to exit. I am under the distinct impression that I was not speeding, but maybe I was. No matter. So I’m going a bit faster than the lane to my left because they have started slowing down due to the traffic that is ahead on the highway. But I am in the exit lane, there is no traffic in front of me. Very quickly, a car in the lane next to me simultaneously puts on his turning signal and starts moving into my lane, right where I am. Sidebar- I hate when people honk at me. It just seems rude. Especially when they aren’t being helpful. At the same time, I’ve been kept from more than one accident because someone, either rudely or helpfully, has honked at me. So I try not to get mad and have been blessed with the grace that I do not get road rage. I really do think it’s grace, and not self-control, or at least not that could be attributed to me outside of the power of God actively working to stop my tomfoolery. And he drove away. I had really mixed emotions. On one hand, this man started by yelling at me, and I was afraid for us both. On another hand, I was so relieved the situation had been defused. 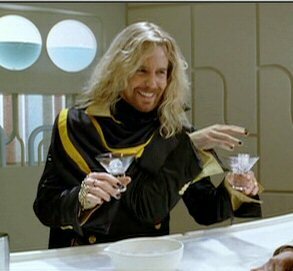 And on another, Zaphod Beeblebrox hand , I was so ashamed. Here was a person obviously not having that great of a day, and all I could do was to apologize. I wished him back, so that I could ask him if he knew about Jesus, and that he was deeply loved, and if there was anything else I could do. Hopefully if anything like this happens in the future, that will be part of the reaction. I think this Jesus relation is pretty self-explanatory, but to delve a little deeper, here’s what I learned about my life in Christ today: It doesn’t usually matter if i am right. If I have hurt someone, no matter how, it’s usually better to just lay down my pride and say I’m sorry. Probably couldn’t hurt, and might just do a world of good. After all, Jesus told us to love like him, and how did he love us? He didn’t just lay down his pride, he laid down his life.